In this March 18, 2019, file photo, students perform the haka during a vigil to commemorate victims of Friday's shooting, outside the Al Noor mosque, in Christchurch, New Zealand. Their voices have thundered across this heartsick city, in parks and at flower memorials and schools. 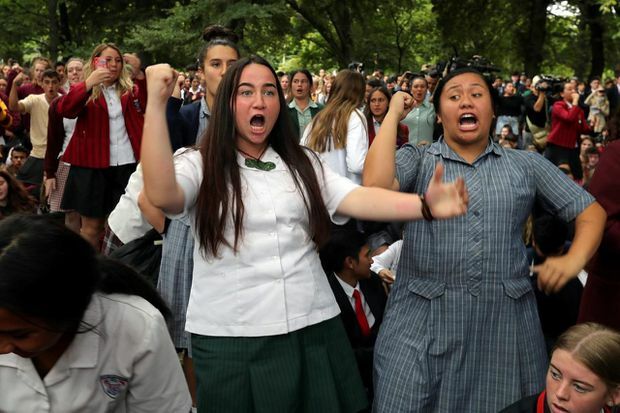 Day after day, the students of Christchurch have gathered, feet smashing the ground in unison as they chant the words of their nation’s Indigenous people in an outpouring of grief and love and support. In the aftermath of last week’s deadly shooting spree on two mosques – for which a white supremacist is blamed – the young people of Christchurch have found solace in an old tradition: a Maori ceremonial dance called the haka. Though hakas were traditionally performed by the Maori people in preparation for battle, they are not all about war, Mr. Wehi says. Hakas are performed to celebrate and to mourn, and are often part of important events such as funerals or 21st birthdays. In the aftermath of the shootings, Mr. Wehi says, people across New Zealand have performed hakas to show support and respect for the victims and their families. This haka, called Tahu Potiki, comes from the South Island Maori tribe Ngai Tahu, said Cashmere High Principal Mark Wilson. Tahu Potiki was an ancestor of Ngai Tahu, and the haka calls for his descendants to rise and claim their place in the new day, Mr. Wilson said. Being part of a haka group can be a powerful emotive moment, he said, one in which people are left uplifted and strengthened. In some ways, the students’ response to the attacks has been similar to the aftermath of last year’s mass shooting at a school in Parkland, Florida, where it was the voices of the youth that rose above the din. The students of Parkland – around 30 of whom actually visited Christchurch last year – united to demand gun law reform. In Christchurch, the students have united in an utter rejection of the intolerance spewed by the white supremacist accused of the massacre.